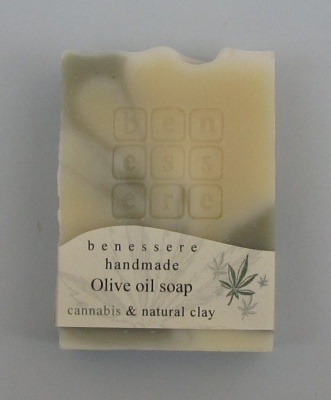 Benessere Cannabis - Handmade soap from pure olive oil, essential oils and clay. The therapeutic and beneficial properties of the clay due to the presence of various metals. The clay is known for its absorbent and the detoxifying properties. It is antiseptic, anti-aging and soothing significantly helps in the regeneration of cells. Handmade olive oil soap with essential oil Cedar, Bergamot, Patchouli and Cannabis oil. This beneficial combination with scent of wood, is anti-inflammatory, moisturizing and anti-aging. The green clay cleans and tones the skin. It's suitable for normal and combination skins. Ingredients : Pure olive oil, coconut oil, distilled water, sodium hydroxide, essential oils, natural clay. Benessere soap is a Greek hand made natural product.